Rule #1: Your first year in selling you are not a sales person, you are a prospector. Rule #2: Every year is your first year in selling. Our unique, high impact sales prospecting techniques will improve your team’s success rate by 300% or more. This highly interactive, fast pace, eye-opening and fun workshop is focused on engaging with the business owners, ‘C’ level executives and decision makers. The Winning Formula approach is designed to show sales professionals the errs of their ways in prospecting and then it shows them the most effective way to engage with busy executives who have the power to allocate budget for your products and services. As a sales professional and leader you know that just showing someone how to do something in a workshop does not guarantee that they will do it; especially if the person has years of experience in doing things differently. When it comes to learning something new or different we all need more than simple instructions. We need to practice, practice, be coached and given feedback, then practice again, right? As part of the Winning Formula program we offer at minimum one to two days of on-site coaching to help the sales executives and prospecting agents to onboard the best practices and build the right habits. These coaching days offer a great opportunity for the team leaders and first line managers to watch, support and learn how to coach the technique beyond the initial roll out phase. After all no enablement will have a lasting impact without positive and ongoing support from the first line managers and leaders. Repetition breeds adoption. Numerous studies have shown that having even shortened refresher sessions/reviews have a huge impact on humans retaining and adopting what they were taught. To ensure that your sales team establishes and retains consistent sales prospecting results we offer short (2 – 3 hours) refresher sessions 30, 60 or 90 days after the initial Winning Formula program roll out. We hear from hundreds of sales professionals that one of the biggest hurdles they see in effective prospecting is their ability to come up with the right opening message that will bring an executive into a conversation. So often times sales executives get stuck on coming up with that first opening attention getter. 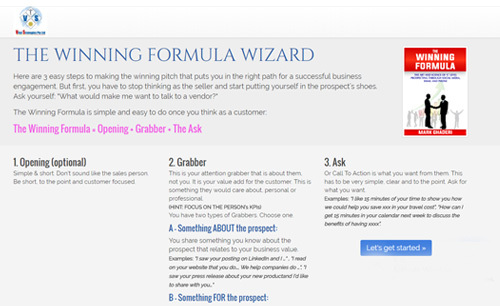 Realizing this challenge, we have developed an online application (Winning Formula Wizard) that will allow your sales and prospecting professionals to write out the opening sales messages that they have prepared and learn how effective it would be based on length and the time it takes to deliver to the intended audience. The application also allows your sales and prospecting professionals to submit their opening message to a Winning Formula certified mentor for review and feedback. Access to the Winning Formula Wizard is provided FREE OF CHARGE to all workshop participants for 30 days. To get more detail on this, or other highly praised and successful programs please contact us via email.